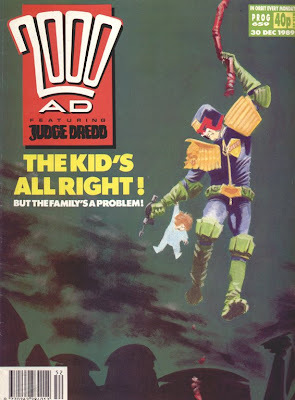 In 1989--when almost all of these episodes were published--Alan Grant and John Wagner still had joint custody of Judge Dredd, with Grant writing about a third of its episodes, and occasionally bringing back recurring supporting characters. Wagner, though, was clearly the one who got to make long-term plans for the series, and he was starting to clear a path toward "Necropolis." That meant a lot of short stories rather than longer ones, and that in turn meant that for most of this year Judge Dredd was effectively a comedy feature that intermittently turned very, very serious. I don't know how many episodes were in the can at any given time, but the sequencing of Grant's and Wagner's respective episodes is sometimes baffling. Maybe it was Tharg's assistant (Richard Burton, at the time), or the writers, who bore the responsibility for deciding what would run in what issue--or maybe it was just decided by what happened to get drawn first. But there are a handful of unfortunate week-to-week transitions: following Grant's maudlin "A Child's Tale" (why are innocent little boys named "Billy" at least 40% of the time?) with a Wagner story that also involves a young unreliable narrator's perspective and kid-style drawings ("The Confeshuns of P.J. Maybe"), or Wagner's "Curse of the Spider Man" with Grant's "The Amazing Ant Man" (naming the mad scientist Henry Pymm is an obvious joke, naming one of the ants Adam is cleverer), or a Grant story about an animal that does a person's will ("A Monkey's Tale") with a Wagner story about an animal with a human mind ("Confessions of a Rottweiler"). It's also curious that the next-issue blurb at the end of "In the Bath" simply bills the following story as "Staccato"--that story turns out to be "John Cassavetes Is Dead," which briefly mentions that Cassavetes was the star of "Johnny Staccato," whose title doubled as Grant's former pseudonym. 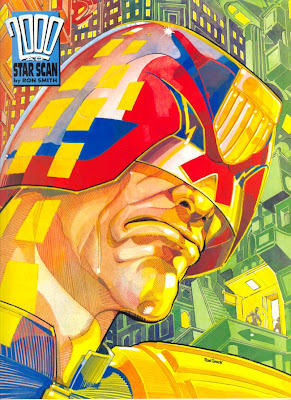 It's the rare "Star Scan" from this era of 2000 AD that doesn't just seem like an unused cover. A lot of the Dredd covers from this era are dramatic shots of him that are unconnected to the story in that issue and drawn by a different artist. The art on the feature itself in this era was even more up-in-the-air than it had been recently, although there are a handful of really solid one-offs here. 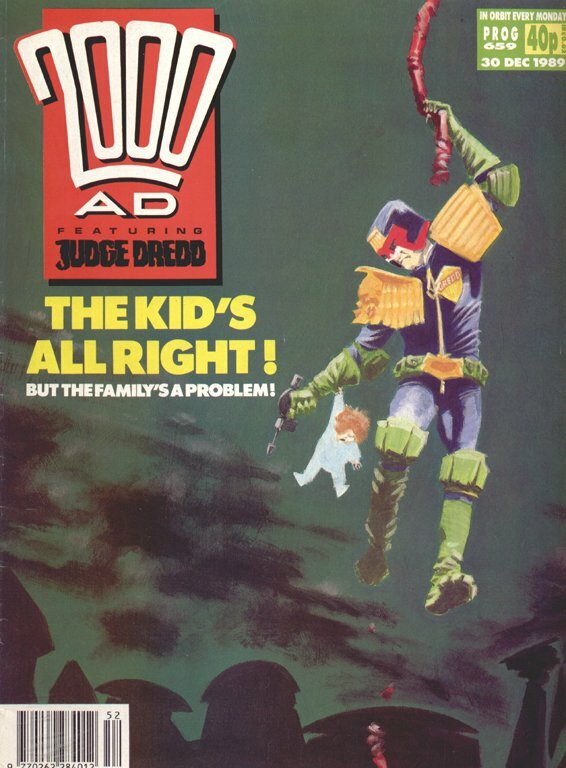 Barry Kitson does right by "A Total Near-Death Experience," despite a story enlivened only by the character name Lazarus Kohlrabi; Steve Yeowell's lovely work on "Family Affair" (the cover's below) is the first of only half a dozen Dredd episodes proper that he's drawn, which is a real shame. 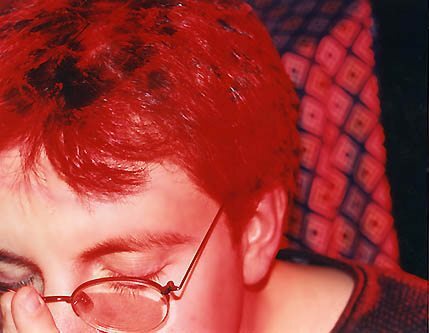 (To be fair, he was smack in the middle of Zenith at the time, and he did eventually draw a hefty chunk of Devlin Waugh.) Jim Baikie is so on top of his game in matching Wagner's ace Damon Runyon impression in "Little Spuggy's Christmas" that it's hard to believe he's the same artist who drew those hasty end-of-"Oz" episodes. Baikie's comedy mode works for "In the Bath," too--a story that's marred by yet another one of Wagner's wacky-foreigners routines, although it also manages to hit the note that Dredd's starting to get old. 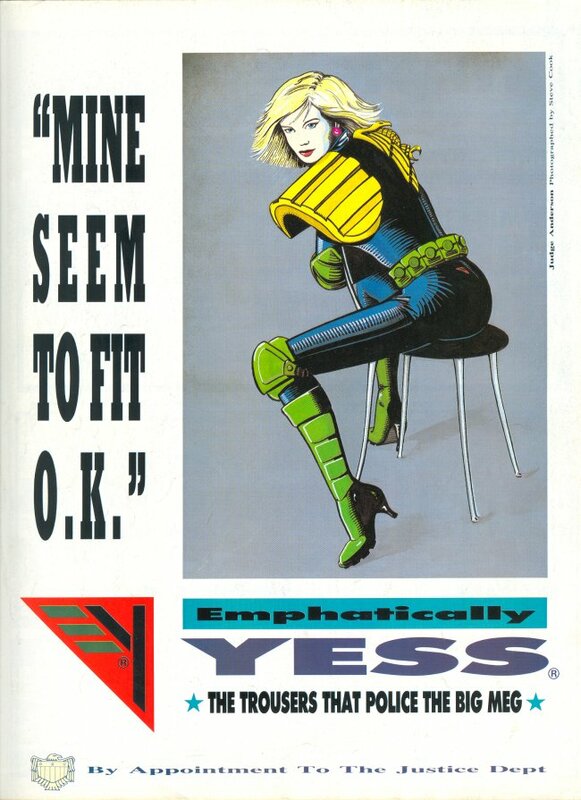 This was also an era where a lot of Dredd episodes were straight-up jokes (rather than satirical thrillers or adventure stories with absurd elements). Grant's "musical" episodes anticipate the tone of the Heavy Metal Dredd stuff from a bit later: "Lockin' Up the House" is a slightly embarrassing take on the rave scene of the time (there's an Alan Moore line in some Bojeffries Saga story about "you kids with your bloody acid house parties" that sums up its attitude), and "Dead Juve's Curve" hews so closely to its model that it actually credits it at the end of the story. There's some neither-here-nor-there artwork in this volume, but the only real visual disappointment is "Banana City," a gritty thriller that couldn't be much less suited to Will Simpson's delicate, impressionistic watercolors. 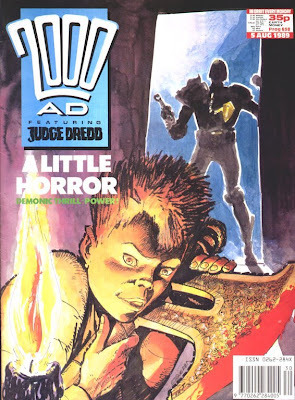 On the other hand, "Kirby's Demon" (of course the kid's first name is Jack...) is reason to stand and cheer--Carlos Ezquerra's first Dredd artwork in 2000 AD in a good long while. 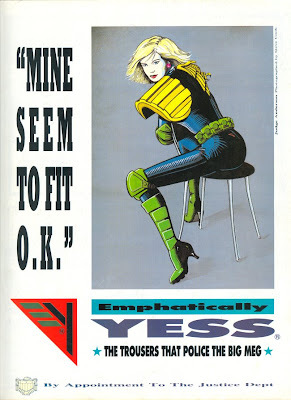 It'd been close to six years since he'd drawn Dredd on a regular basis, and this and his other stories here (notably "Young Giant," whose distinctions between which perps it's okay for Giant to kill and which it isn't are not particularly carefully constructed) seem like five-finger exercises to limber him up for the 31 straight full-color episodes of "Necropolis" we'll see in Case Files 14. Judge Dredd's post-"Oz" holding pattern finally resolves with "The Shooting Match," a resonant little sketch of a story that started the movement toward "Necropolis" in earnest. (John Higgins was exactly the right choice to draw it. Nobody does complicated lighting arrangements like he does, and this story's all about the shifts of light in a single room.) Also note the closing note of the close-up on Kraken's badge: there's a very sharp callback to that coming up. 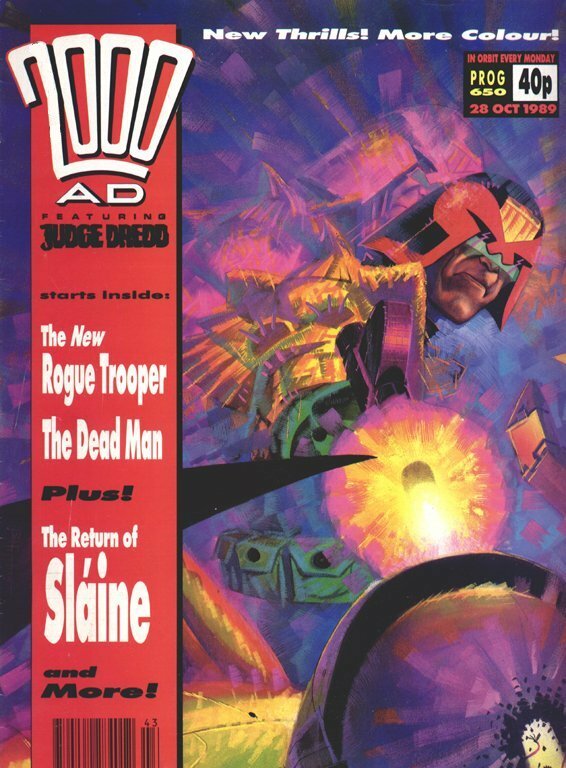 The timing of the "Necropolis" lead-up has to have been tricky: the landscape of Mega-City One was obviously going to be very different after "Necropolis" than it had been before, so Dredd had to burn off pretty much all of its standing inventory, and as of the issue where "The Shooting Match" appeared, the clock was running. (Yes, I'm being deliberately ambiguous about why, for the benefit of the few readers of this blog who are following along with the books week by week.) Which may be why we get fluff like "It Still Pays to Be Mental" and "I'm Manny, Me Fly" in the later pages of this volume. 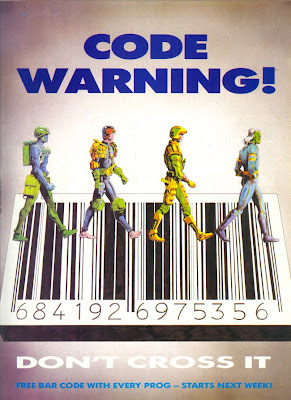 Still, this was one of 2000 AD's golden moments: at one point, "Song of the Surfer," "The Dead Man," "The Horned God Book II" and "Zenith Phase 3" were all running simultaneously. Grant and Wagner both get in thematic sequels to "Letter from a Democrat" in the final section of this batch, although Grant's "Politics" falls flat: it's effectively "The Man Who Knew Too Much" reprised less effectively. 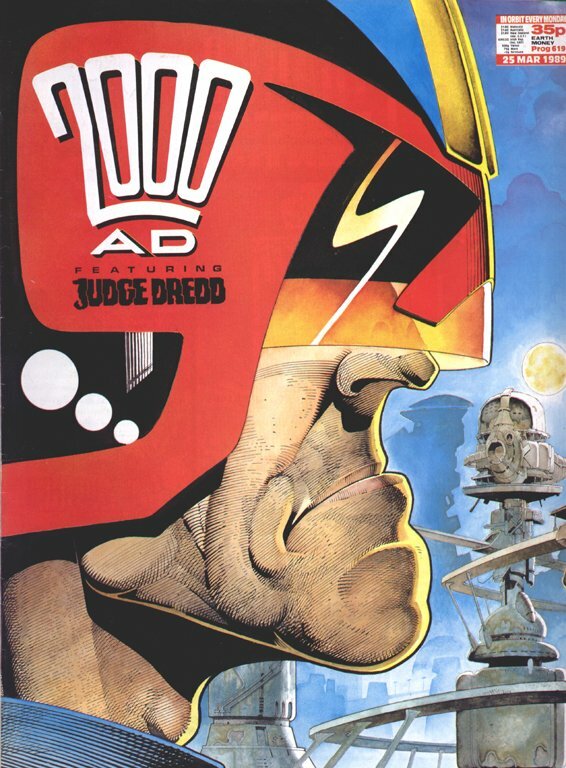 "A Letter to Judge Dredd," on the other hand, is a pivotal episode, if a curious one. It's a serious moment that makes Dredd call his entire world-view into question, surprisingly quickly (we've seen him have doubts about his performance before, but not about the system of which he's a part). So it's strange that it's got two big, goofy jokes looming over it: the kid being named "Wm. Wenders," as in Wim Wenders--there's an innocent little boy named Billy again!--and the "giant pineapples from space" routine at its end. "Necropolis" and its prequels seem, in many ways, like Wagner's attempt to wrap up his run on Dredd, both plotwise and thematically: "Cardboard City," for instance, returns to the long-ignored Maria basically just to move her off the board. (Arguably, "killing" Chopper fell into the same category.) I'll be going into that idea a lot more when I get to Case Files 14, the all-"Necropolis" special, in a couple of weeks. 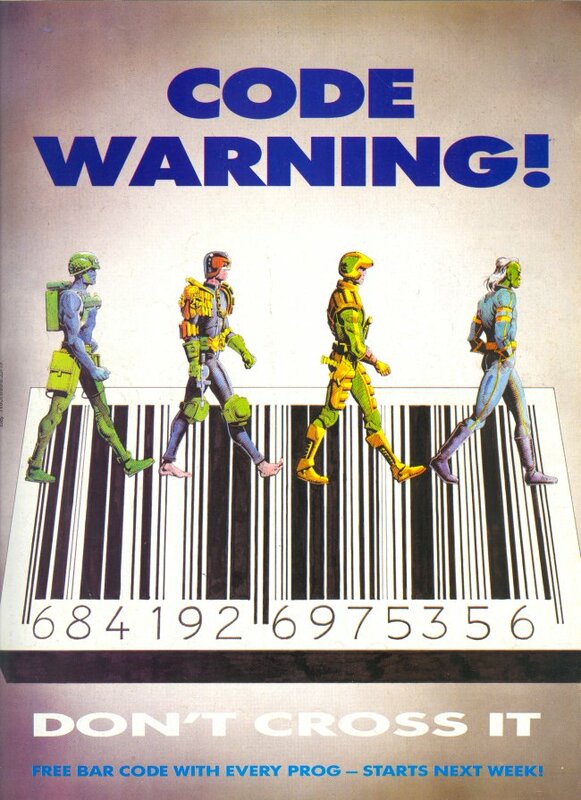 The back cover of #633, seen above, was the first blatant hint that Dredd might be ending: an announcement that 2000 AD was about to get a bar-code on its cover, staged as the cover of Abbey Road, with barefoot Dredd playing Paul. Next week, though, we return to spinoffville for Tales of the Dead Man, the collection of Keef Ripley and John Ridgway's Cursed Earth thriller that ran during this period.